Those of us who do fashion sewing sometimes have difficulty identifying what we do in a single descriptive word. A “sewer” (not those stinky things that go underground that happen to be spelled the same way) can be one who sews many different things, right? The term “sewist” is a somewhat new word, made up of sew + artist, which really doesn’t describe anything specific to my way of thinking. Most of us are not “designers” (and not all designers can sew), although most of us use some design techniques in our fashion sewing. Some of us may be “sewing professionals,” a term which covers a broad range of endeavors, such as being a custom clothier, a sewing teacher, a writer about sewing, or even a retailer involved in the sewing industry. The term “seamstress” implies one who sews on a machine, as in a factory; although this person may be very talented in certain techniques, her job does not leave room for innovation or creativity. And that is why I like the term “dressmaker” so much. In one word it expresses many things explicit and implied. And although it is a term much used until the 1960s and not much since then, I consider myself a Dressmaker; maybe you do, too? This wonderful Vogue book, copyright 1957, still used the term “Dressmaking” in its title. A dressmaker is one who makes custom clothing for women (oneself included.) She usually works from a commercial pattern, and then uses all her creative, design, and technical skills to create a one-of-a-kind dress, blouse, skirt, coat, etc. I have devised this ABCs of DRESSMAKING to define some of the important aspects and practices of dressmaking, especially in the couture sense. R is for Risk. Let’s face it, fashion sewing can be risky. We can be sewing with really expensive or “difficult” fabric or vintage fabric, which is now no longer available – or sewing with a complicated design/pattern – or making something for a very special occasion – and the outcome is entirely in our hands! It takes bravery, confidence in one’s skills, patience, and a willingness to take a risk to grow in our dressmaking, but the rewards are manifold. One of the Dressmaking signs I have hanging in my sewing room. E is for two things: Engineering and Embellishment. I have said this before, but it bears repeating – sewing is engineering. I love to read pattern instruction sheets, especially for something that is complicated, and I bet many of you do, as well. It’s fascinating to see how patterns go together, how different fabrics demand specific approaches to that process, how the pattern pieces need to be manipulated to fit one’s particular form. A well-engineered pattern is a beautiful thing, and it takes a sewing-engineer’s mind to know how to best bring that pattern to life in a stylish and successful fashion. It takes a dressmaker. Another one of my signs, the first one I purchased and still my favorite! Embellishment is almost synonymous with the term dressmaker. “Dressmaker Details” include such things as ruffles and frills, ribbon, or braid, but also those little touches that add so much to a successful garment, such as well-chosen buttons, interior trims, non-boring linings, covered snaps, bound buttonholes (when appropriate), and the creative manipulation of, or addition to, a pattern to get the effect you want. A creative dressmaker can start with something basic and make it unique – and couture – by adding just the right embellishments or details. S is for Seams. This is about as basic as it gets, but those seams must be sewn well and finished well for a successful finished garment. One of the techniques I learned in the couture sewing classes I have taken with Susan Khalje is, for me, the method to achieve successful seams. That is – thread basting along seam lines to use as your sewing guide, rather than relying on the seam allowance markings on one’s sewing machine. This is the building block for successful dressmaking. And then, finish those seams on the inside to control bulk and add to the wearability and durability of your garment. S is also for Steam. As in ironing. A good steam iron is worth its weight in gold! Steam is useful in so many ways – here are just a few: 1) When sewing with wool or most dry-cleanable fabrics, a good place to start is steaming your fabric before you begin to lay out your pattern pieces. Even if you have pre-washed cotton or linen fabrics, a good initial steaming of your yardgoods will insure a better outcome. 2) Steam newly sewn seams flat to set your stitches before spreading the seam open for its second pressing. 3) Contours can be set beautifully with steam, especially when using a pressing ham and/or a seam roll, or draping your work-in-progress on a dress form. The Vogue Dressmaking Book has an entire section on pressing, with guidelines still appropriate almost 60 years later. Click on the image to read the page. And then, S + S is for Sewing Sense, which is what every successful Dressmaker must develop. This subject is so vast it warrants its own blog post sometime in the future! Are You a Hopeless – or Hopeful – Dressmaker? 1) you arrive at your destination, only to find that aforementioned sewing thread clinging to your skirt , or you find a straight pin still holding tight to a finished garment. 2) a sale on Gutermann thread makes your heart go a-flutter. 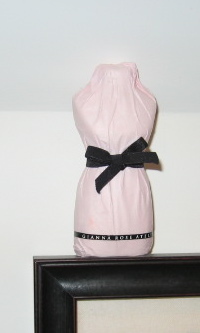 3) you receive a bar of soap in the shape of a dress form in your Christmas stocking! 4) you instinctively check plaid lines and design placement in the clothes of everyone you meet to see if they match. 5) a new issue of Threads Magazine or Vogue Pattern Book Magazine (or Burda Style, etc.) arrives and it becomes your nightly reading until you have gone cover to cover. A birthday card for a fashionable friend! 7) you can’t wait to study the instruction sheets in new patterns (in my case, new-to-me vintage patterns). 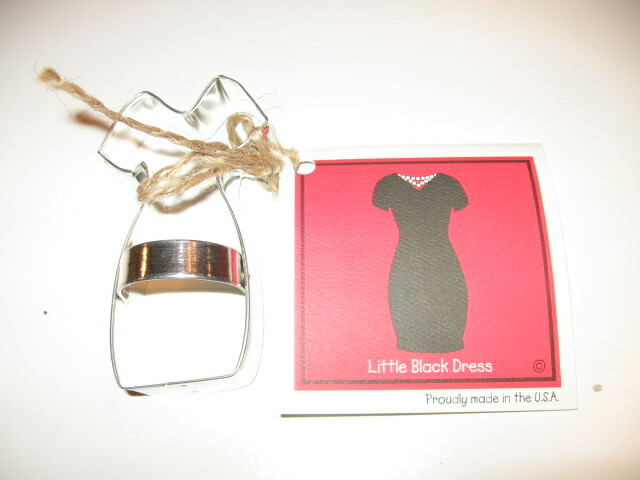 8) one of your favorite cookie cutters is a Little Black Dress. 9) you maintain a steady supply of muslin and silk organza underlining, because you never want to be without these building blocks of couture sewing. 10) your pets wander into your sewing room asking forlornly for their supper, as you have lost complete track of time. So then – how do you know you are a hopeful dressmaker? It doesn’t get much better than that! Well . 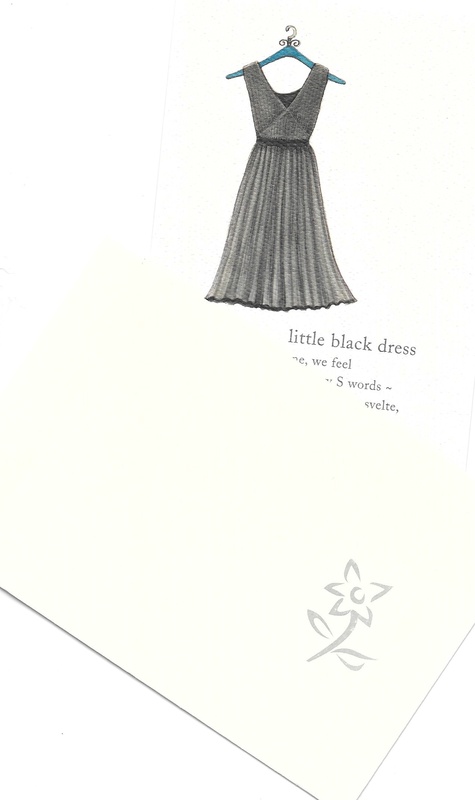 . . in an effort to share a bit of my hopeful hopelessness and have some fun, I’m having a giveaway of duplicates of 1) the dress form soap, 2) the Little Black Dress cookie cutter, and 3) the Little Black Dress birthday card. Happy Valentine’s Day to each and every one of you!